Roku manufactures several different devices that can be connected to any television set that allows you to watch what you love but pay for only what you want. With Roku, you have access to the biggest selection of streaming channels in addition to other innovative features that will change the way you watch television. With Big Apple Buddy’s personal shopping service, you can now buy direct from the Roku online store anytime, anywhere. Every Roku player gives you access to more than 2,500 channels on demand and more than 300,000 movies and TV episodes. With any of their devices, you can search across more than 20 top streaming channels so that you can be sure you find the best option and price out there. You can connect either your phone or your tablet to the Roku 3 and have an endless amount of amazing content to choose from. With this device, you can use your voice to tell your enhanced remote exactly what it is you’re looking for. You’ll get immediate results that are comprehensive by title, actor, or director. If you enjoy watching television late at night while everyone else is asleep, you no longer have to worry about waking others up with the noise! The Roku 3 comes with headphones that you can plug into your wireless remote for private listening, and you can feel free to listen however loudly you’d like. 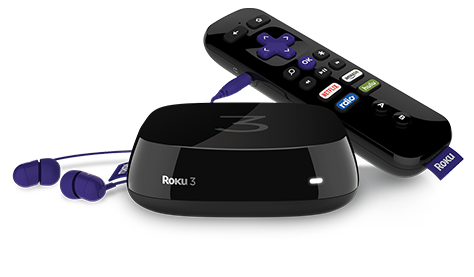 The Roku 4 is a brand new streaming player that is now available for pre-order on the company’s US online store. This device comes equipped with even more powerful streaming, stunning resolution, and incredible features. With the Roku 4, you get the absolute best picture quality: amazing detail, realistic color, and smooth motion. It also comes with the same convenient speech recognition software and headphone set that comes with the Roku 3. And don’t worry about losing your wireless remote - all you have to do is press the button on the top of your Roku 4 device, and your remote will immediately tell you where it’s been hiding! Pre-order your Roku 4 today and enjoy the amazing picture and sound quality that your television has to offer. Unfortunately, the USA Roku Streaming Player online store does not currently offer international shipping. However, Big Apple Buddy, your personal shopper, can help you buy products direct from the official USA Roku Streaming Player online store and ship them to your doorstep, no matter where you are in the world. We offer international shipping to over 110 countries including Australia, Austria, Azerbaijan, Bahrain, Belgium, British Virgin Islands, Brunei, Bulgaria, Canada, Chile, Costa Rica, Croatia, Czech Republic, Denmark, Estonia, Fiji, Finland, France, French Polynesia, Germany, Gibraltar, Greece, Greenland, Hong Kong, Hungary, Iceland, Indonesia, Ireland, Israel, Italy, Japan, Jordan, Kuwait, Latvia, Liechtenstein, Lithuania, Luxembourg, Macau, Malaysia, Maldives, Malta, Marshall Islands, Mauritius, Monaco, the Netherlands, Netherland Antilles, New Zealand, Norway, Oman, Poland, Qatar, Romania, San Marino, Saudi Arabia, Serbia and Montenegro, Seychelles, Singapore, Slovak Republic, Slovenia, Spain, South Africa, St. Lucia, Sweden, Switzerland, Taiwan, Thailand, the UAE, the UK, Vatican City, and Vietnam. If you would like to buy from the USA Roku Streaming Player online store, simply let us know which items you would like to order (by filling out the form below) and we’ll get back to you with a free international shipping quote within 24 hours!